"This isn’t as good as the last “Deadpool Team-Up” that had Hercules, but it’s still not bad ... A rompin’ good time for $2.99." "Benson is not a good writer and his take on Deadpool is not entertaining. He's trying to hard to be funny and his 'humor' is so lazy that he makes Victor Gischler looks like a genius!" "Suicide Kings wasn't perfect by any means, but it did show Benson had a solid grasp of the character and wasn't likely to crap the bed here. "Not crapping the bed" may sound like faint praise, but think of the alternative…"
"It's mostly just a lot of scampering around and backstabbing, as a bunch of freelancers stumble over each other to satisfy a Mexican crime boss. You know, like that Peckinpah movie about Alfredo Garcia, except instead of the tormented and sardonic Warren Oates, we get Robin Williams in a Ryan Reynolds costume. And the Zapata Brothers! They're Mike Benson creations from "Moon Knight" who talk like third-rate Tarantino rip-off characters from 1995 but dress like luchadores." "Overall, it may be disposable, but if you're one of those Deadpool diehards who buys all these books, this won't disappoint." "In short, this issue had really funny parts, I liked the character interactions, and it was well drawn but the story dragged on and I saw the twist coming from panel two." "Is Benson’s story perfect or even special in any way? Not really. But that doesn’t mean that Deadpool Team-Up #898 isn’t an entertaining comic worth checking out if you are a Wade Wilson fan." 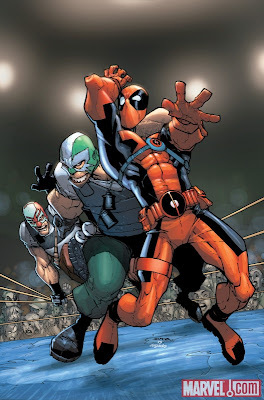 "if we keep getting fun stories where Deadpool teams up with Mexican wrestlers, I’ll deal with far too many Deadpool stories." I highly recommend this title to any Deadpool fan, or anyone who likes Team Ups.